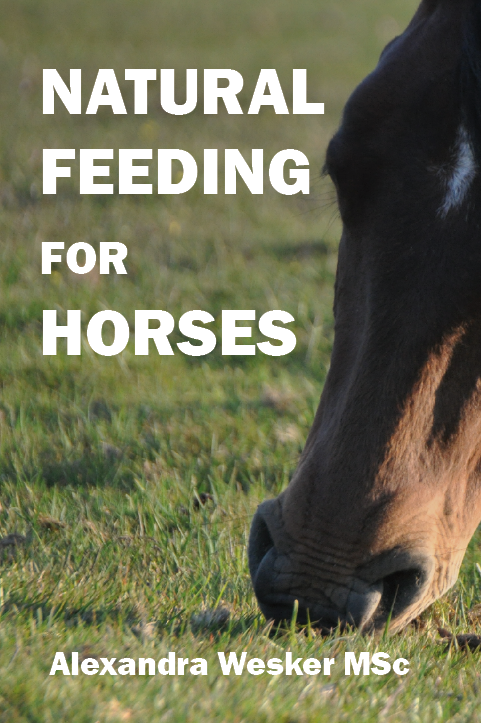 I was recently asked by U.K. based author and consultant, Alexandra Wesker, MSc, to review her new book "Natural Feeding For Horses - Discover Roughage Based Feeding for the Physical and Emotional Health of Your Horse". Ms. Wesker writes that she had a hard time as a Equine Nutritional Consultant in finding a book to recommend to her clients, so she decided to write the book she was looking for. The result? A thoughtful, well researched and written book that will make a positive impact on horses as it makes it's way into the hands of horse owners. This book can be used by new horse owners who just want a basic understanding of horses, digestion and feeds, as well as the old experienced hands who want to delve into formulas for developing a feeding program based on their horse's size, breed, activity level, and considering the digestible energy and nutritional vales of feeds. What is Natural Feeding? In a nutshell, it's feeding a roughage (hay) based diet and feeding in a manner like nature, including horse's eating off ground level. Alexandra addresses this in detail and why this is very important. Like many people, I have used several different types of feeders and was happy to find large plastic milk crate type boxes so I could feed my horses at ground level, which is how they are designed to eat, as well as keep the feed off the ground to minimize the ingestion of sand. But this book is more than that. I liked the section of the book discussing various grasses such as Orchard, Timothy, Bermuda, the various Fescues, Brome, Blue Grass, Ryegrass and others, and the charts on the nutritional value of hays. Others will appreciate the Suggested Diets chapter. Ms. Wesker follows up with many examples of horses, their breed and activity, and feeding examples. So, if you have ever been confused about determining the digestible energy content of the feed you provide your horses, or what level your horse needs based on it's activity and size, then this book and it's easy to understand formulas will help as she walks the reader through determining activity levels, required feed level, designing feeding programs, and information on safely replacing feeds with cereals. She advocates about consistency in the feeding program and the necessity of making changes gradually. The last thing I would like to say if that Alexandra recognizes the emotional or mental health aspect of horses and advocates horses being able to move, obtain overhead cover and not be kept in solitary conditions - which I appreciate as I see way too many horses who are viewed and treated as tools or objects and not living, thinking and feeling creatures. Stabling a horse, by itself, in a small stall, no matter how good your feeding program is, is akin to mental/emotional abuse. Those conditions alone are likely to cause behavior and digestive problems. It is my wish that all horses could be given a fair deal by their owners and a continuing education in horses and their care is the road towards that. Buy the book, you won't regret it. You can also check out Alexandra's website: Natural Feeding For Horses.